The Rigol DP711 is a very high quality programmable laboratory power supply with one DC output (30 V/5 A) and a maximum power output of 150 W. Like all Rigol devices, the power supply features a very well constructed and easy to use interface, which also offers comprehensive ease-of-use functions, such as programmable voltage curves. The menu has an intuitive structure. 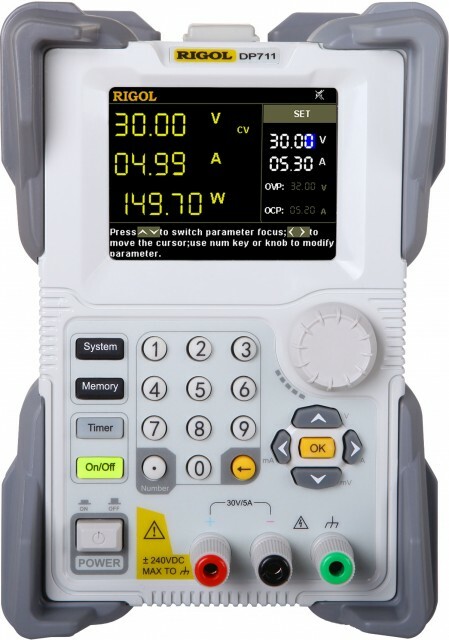 The Rigol DP711 features a relative large (8.9 cm / 3.5") and easy to read TFT display. A timer control can be used to set the output signal to different values in up to 2048 groups.